Oh crap, a typo?!?! Maybe I really AM an animal! The big difference between a blog and a newspaper? I just corrected the typo. Way to prove his point by having a major typo. You’re right, but the knowledge is not so esoteric or secret, like only the clergy knowing Latin in the Middle Ages. Still, the argument should be about the low value Gannett places on news gathering and reporting, rather than a quibble about whether bloggers are real writers (which we totally are). * Reporters are trained, skilled professionals who receive compensation for their work, which is in turn executed under an ethical and economic framework designed to reduce bias and seek truth. * Bloggers are people who like to write. These definitions are accurate and fair. It’s easy to see why journalists would be frustrated to be competing with bloggers. I don’t think the newspaper industry has failed to embrace new technology; but rather it continues to fail to engage citizen interest in writing beyond the “letters to the editor” page. In any case, King’s comment is certainly unwarranted. Bloggers are not “animals.” Rather, virtually all of us our amateurs. That doesn’t mean we can’t achieve Olympic feats; just that we are not yet part of a professional class. Do we have to attack each other? Can’t we just allow that passions run deep and things are said in the heat of the moment? Print journalists — especially with 20-30 years’ experience – can set themselves above the blogosphere because it’s killing their livelihood and people who don’t get paid a living wage are taking jobs from those who once did. We’re eating our young and then quibbling about it and gnashing our teeth at each other. Please, let’s practice empathy, sympathy and humanity. We don’t need to act like the publishers out there — we can be civil and compassionate. HUMAN and intellectuals — who have learned to rise aove pettiness and backstabbing. Please don’t kick folks when they’re down — surely you’ve learned better. I don’t disagree that maybe I was a little harsh. But I have a Philosophy degree, took 2 – 3 journalism classes in college, and have been a newspaper columnist for 17 years, so I at least understand journalistic writing. I’ve also been a blogger for 14 years, and have taken great pains to be the best I can be — definitely not a scribbler. And there’s nothing really special about any other trained (or self-taught) writers who have learned the journalistic method outside of college. In my past, I’ve done magazine writing, marketing copywriting, web writing, business writing, playwriting, speech writing, and blogging. There’s nothing wildly different about newspaper writing than any of the others. So while I do agree that newspaper writers have SOME specialized knowledge, when they’re going up against other real writers (i.e. someone who’s done more than take a weekend writing class at the library), there’s nothing special they’re doing that non-journo writers aren’t. I completely agree with your point, Erik. It’s insulting to be referred to as an animal, and perhaps Bobby’s emotions were running high after witnessing the loss of many colleagues yesterday. But I challenge you to rise above the counter-attack. “Look, you guys don’t have any special knowledge or skills.” Journalists do typically have a 4-year specialized degree, sometimes even beyond a bachelor’s. I think this is just as harsh as the animal comment you referenced in Bobby’s post. As a designer, I can relate to what Bobby is alluding to – although I wouldn’t use that tone. While I have a degree in design and a decade of experience in the industry, people assume they can do my job simply because they have Photoshop on their home computer or they’ve puttered around with ‘desktop publishing.’ Although I certainly agree anyone can and should be capable of design (or writing great content), I studied it in school, interned under professionals and chose this as my life’s work. Does that mean I have special knowledge. Yes, I think it does. I have a piece of paper with a foil stamp on it that says I’m more special than the lady down the hall who has a 2007 version of Pagemaker on her Dell and a new hobby. Is the industry changing? Yes. 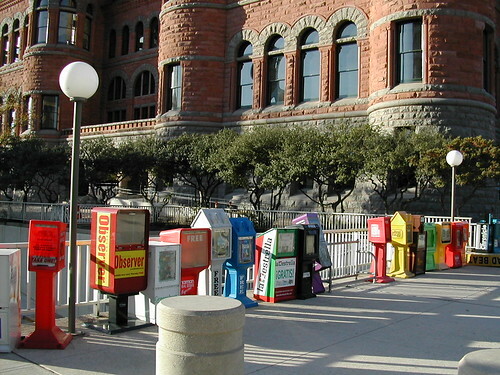 Should newspapers adapt to more web, less print? Probably. But I don’t see anywhere in Bobby’s post where he is arguing against online content. He is merely defending his newspaper colleagues and questioning Gannett’s insensitivity to the people who made their business profitable. I think bloggers are fantastic, so thanks for opening up the conversation and being passionate about what you do. Just wanted to share my thoughts. We are all fighting the same fight. Better content, less greed and protecting journalists/writers/bloggers from untimely and unjustified layoffs. Thank you. I too was shocked when I read that line. If the writer was trying to make the point that print journalists are held to a higher standard then I at least see what they were attempting to say, though I would still argue the point. But to say “animals” denigrates bloggers unnecessarily and gives insight into why so many print publications were too slow to make the digital jump and why they are paying for it today.